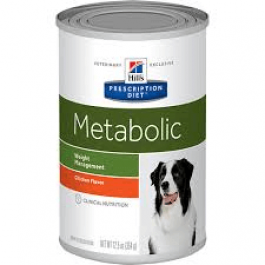 Hill's Prescription Diet Metabolic Canine is recommended for overweight and obese dogs, as well as weight maintenance after weight loss. This food is clinically proven to safely provide 28% body fat loss in 2 months in dogs and avoid weight regain following a weight loss programme. High scientifically formulated nutrient complex - provides appetite regulation, reduces inflammation and improves energy metabolism. High soluble and insoluble fibre to trigger satiety, control appetite, and maintain gastrointestinal health. High L-carnitine - helps dogs burn fat while sparing lean muscle mass, resulting in more effective weight loss. High L-lysine - helps metabolise fat for energy production and maintain lean body mass. High superior antioxidant formula - defend cells from free radical oxidation, promoting a healthy immune system. Pork, maize, egg whites, chicken, cellulose, rice, tomato pomace, flaxseed, coconut oil, minerals, DL-methionine, carrot powder, L-leucine, salt, vitamins, trace elements, taurine, L-carnitine, beta-carotene. 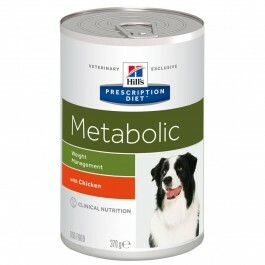 Hill's Prescription Diet Metabolic Canine should be recommended by your veterinary surgeon. For detailed information on feeding amounts and how this food can help your pet, please consult your veterinary surgeon. Exclusively feed the recommended Prescription Diet Metabolic food and&nbsp;Metabolic Canine Treats.&nbsp;Please note that this is a guide only and that individual animals may have different requirements. Adjust the feeding amount to maintain the optimal body weight and keep fresh water availalbe at all times. FOR WEIGHT LOSS:Determine the amount to feed based on the target weight rather than the current weight. FOR WEIGHT CONTROL:Patient should be monitored to ensure proper body weight is maintained. Increase food amounts accordingly.